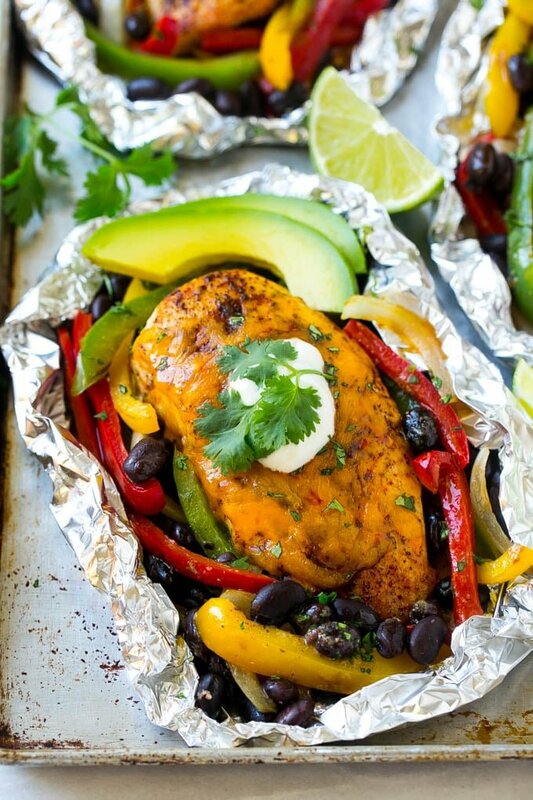 Chicken fajita foil packets are the easiest way to have a complete fajita meal. If you have some guests or you want more Mexican flavor you can also serve Mexican coleslaw or restaurant style Mexican rice. 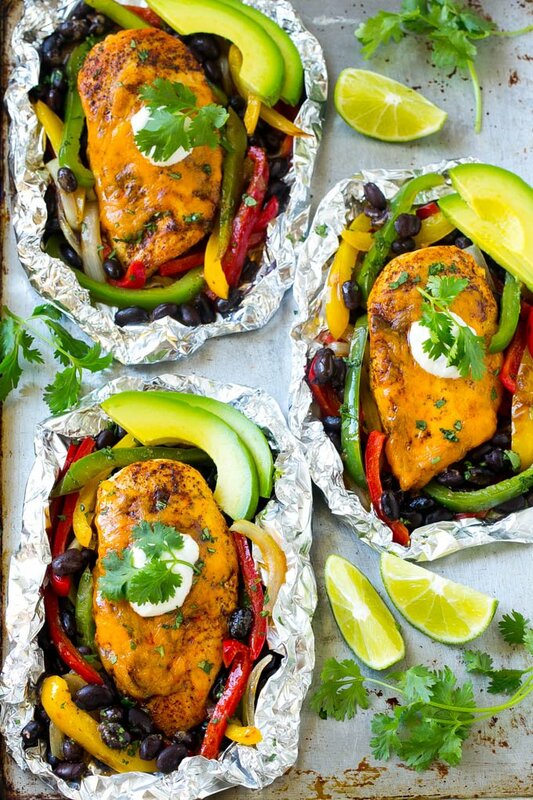 It’s all about the foil packet dinners in our house this summer! This time around I’ve got chicken fajita foil packets that are a complete meal with minimal clean up! 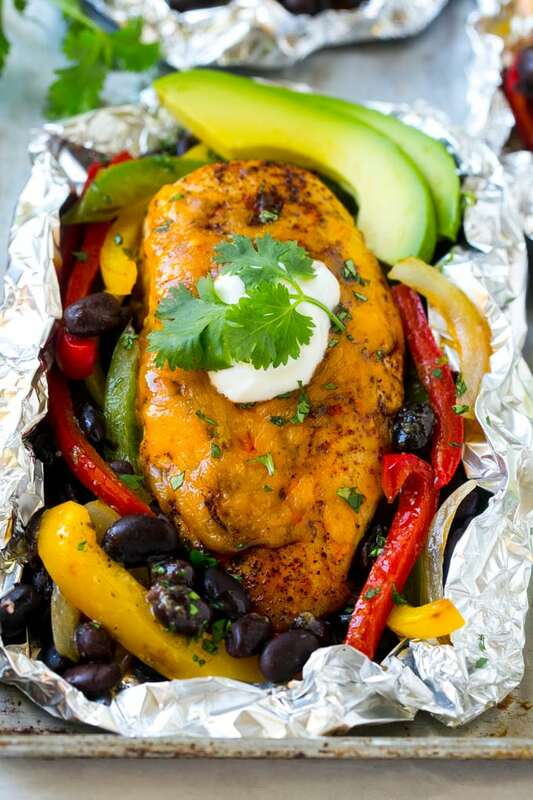 These foil packets are full of Mexican cheesy chicken, peppers, onions and black beans. It’s a classic flavor combination that makes for an amazing meal. How Do You Make Chicken Fajita Foil Packets? The first component of this recipe is the Mexican spiced butter, which has just a handful of ingredients and is ready in minutes. 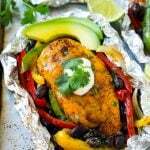 Chicken breasts are arranged on sheets of foil with sliced bell peppers (any color works! ), black beans and onions. The chicken and pepper mixture is drizzled with the seasoned butter, then wrapped up in foil and can then be baked or grilled to perfection. I like to top my fajita chicken foil packets with classic fajita fixings like avocado, cilantro and sour cream. Other great additions would be salsa or sliced olives. After your fajita packets are ready, simply slice up the chicken breasts, grab some tortillas, and dinner is served! I use medium sized chicken breasts for this recipe, approximately 4 ounces each. If the chicken breasts are overly large you can cut them in half lengthwise so that they’ll cook evenly inside the foil packets. I love the combination of all the different colored peppers, but it’s totally fine to use whatever you happen to have. I have also made these chicken foil packs with pinto beans instead of black for a little variety. These chicken fajita packets are perfect in the oven or on the grill. It’s a super easy way to have a fun and festive Mexican dinner without a lot of clean up! In a small bowl mix together the chili powder, cumin, garlic powder, onion powder, salt and pepper. Preheat the oven to 400 degrees or a grill to medium high heat. Divide the seasoning mixture in half. Place half the seasoning in the melted butter and stir to combine. Coat 4 large squares of foil with cooking spray. Place a chicken breast in the middle of the foil and season with the remaining spice mixture. Arrange the peppers, onion and beans around the chicken. Drizzle 1 tablespoon of the butter over the chicken and vegetables. Fold the foil around the chicken mixture to close completely. Bake the foil packets for 40 minutes or grill for 35 minutes. Carefully open the foil packets and sprinkle the cheese over the chicken and vegetables. Return the packets to the grill or oven for 2-3 minutes or until cheese is melted. Sprinkle with cilantro and add fajita toppings such as sour cream and avocado. Slice the chicken and serve with tortillas on the side. This recipe is amazing! It was my first time cooking chicken (picky eater) so I was a little bit nervous, but the chicken came out so moist and flavorful. It was a really easy recipe to make and very fast too. I’m definitely going to make this again! Easy fajitas? Where have they been all my life? Great idea! Well I tried these and they were amazing and easy! It’s so hot here! I will be putting these on the BBQ tonight! What a perfect meal packet!